At Kirkman Chiropractic, we have the experience and expertise to help you get better and stay better – naturally. As a chiropractor in Orlando we understand that making health care a priority can be difficult in today’s busy lives. That’s why Kirkman Chiropractic is designed for Southwest Orlando area residents’ convenience! 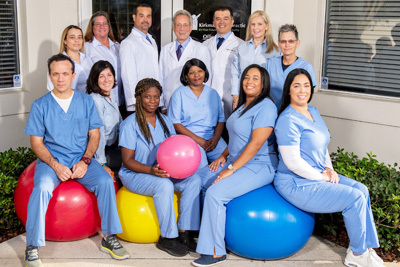 Our 3,000 square foot clinic on Kirkman Road is located minutes from Universal Studios, with easy access from both the 408 / East-West Expressway and Interstate 4. In addition to chiropractic care, Kirkman Chiropractic offers massage therapy, physical therapy/exercise rehab and in-house X-rays – so you don’t have to drive all over town for different appointments. Kirkman Chiropractic offers late-night, early-morning and Saturday hours, and many of our staff of twelve are bilingual. Kirkman Chiropractic is a participating provider for most major medical plans, including Medicare, Medicaid and Worker’s Compensation, as well as all auto insurance carriers. The goal of Kirkman Chiropractic staff is to see everyone in the Orlando area embrace a wellness-based lifestyle, where maintaining health, rather than simply treating illness, is a priority. That’s why we go to great lengths to make our practice as convenient, accessible and helpful as possible! Our computerized diagnostic tools and techniques, including digital range of motion testing, thermal nerve scanning, digital foot scanning and computerized muscle testing, help our team of professionals locate the underlying source of your pain or illness, so we can work to correct it rather than simply masking the symptoms. We provide Wellness Workshops on a variety of health topics to help patients understand the role a healthy spine plays in overall health and wellness. When our patients understand how they can contribute to their own long-term health goals, they are more motivated to make those lifestyle changes. If you were injured in an automobile or workplace accident, we can help! Our combination of chiropractic care, physical and massage therapies and exercise rehabilitation will have you feeling better and enjoying life again. Whether your goal is to get out of pain, recover from an accident or begin living a wellness lifestyle we want to help you achieve those goals. Call our Orlando chiropractic office today to see how we may be able to help you.